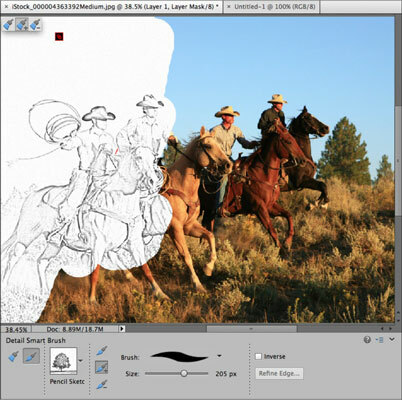 Select the Detail Smart Brush tool from the Tools panel in Expert mode. The tool icon looks like an art paintbrush with an adjacent gear. You can also press the F key to switch between the Smart Brush and Detail Smart Brush tools. In the Tool Options, choose a brush tip the Brush Preset Picker drop-down panel and adjust the brush tip size as desired. Feel free to change your brush tip and size as needed to achieve the desired effect. Select an adjustment category and then your particular preset adjustment from the Smart Paint drop-down panel in the Tool Options. Effects include making your image look like a film negative or an X-ray, as well as more subtle looks, such as creating a vintage photo with the Sepia Duotone effect. Elements supports touch-screen capability on both Windows and Mac platforms. If you have a touch-screen monitor, or an iPad with a VNC (Virtual Network Computing) application, you can browse images in the Organizer by simply flicking with your fingers. What’s even cooler is that you can even retouch and enhance images by using all the tools in the Tools panel with your fingers. Mouse? You don’t need no stinkin’ mouse!